← Friday 3rd April 2015 – What clever girls you are. I’ve just come in from sowing more seeds. The Onions and Garlic will be going out in the allotment very soon, so I’m starting to move them from the safety of the greenhouse to the garden table. I tend to do this with all my plants. They spend a week or two on the garden table, and then it’s on to the allotment. It’s a bit like a half way point for them. Doing this also helps make room in the greenhouse for all the plants that need to stay in the greenhouse for their entire life, like Tomatoes, Peppers and Melons etc. This afternoon I’ve been very busy sowing all sorts of seeds. Are you ready for the list? Hold onto something as there are quite a few. Here goes. A selection of various Brassicas: Cabbage “All your round” (this is a mixture of various cabbages of different shapes, sizes and colours) and “Primo (II)”, Brussels Sprout “Camelot F1” (I grew these last year, and they’re really tasty), Cauliflower “Graffiti F1”, I love these as they’re bright purple, so beautiful, and Kale “Starbor F1 – Mini Veg”, I’ve grown Kale before but not this variety. It’s very good for you and is great sautéed. Then onto the Sorrel “Red Veined” which I grew last year and it comes back every year, but I’m sure I’ll find room for a few more plants in the herb bed, Sweet Pepper “Romano Mixed” again these grew well last year, but I’m sure I can do better and some “Electric Daisies”, which are always fun for trying on unsuspecting people. Inside the packet it tells you how to make Mango and Electric Daisy Sorbet, I may give that a go. Nearly there, just a few more. I sowed 10 pots of Pea “Kelvedon Wonder”. Each pot had 4 peas in them, planted north, south, west and east. I’ll sow some more in about a months time, then we have a good supply throughout the summer, some Cress “Fine Curled” and finally some herbs Coriander “Calypso”, Parsley “Moss Curled 2” and finally “Chives”. Again with the herbs, sow little and often. Coriander goes to seed very quickly. Oh and one final thing, I just thought you’d like to see a photo of my Kohl Rabi. 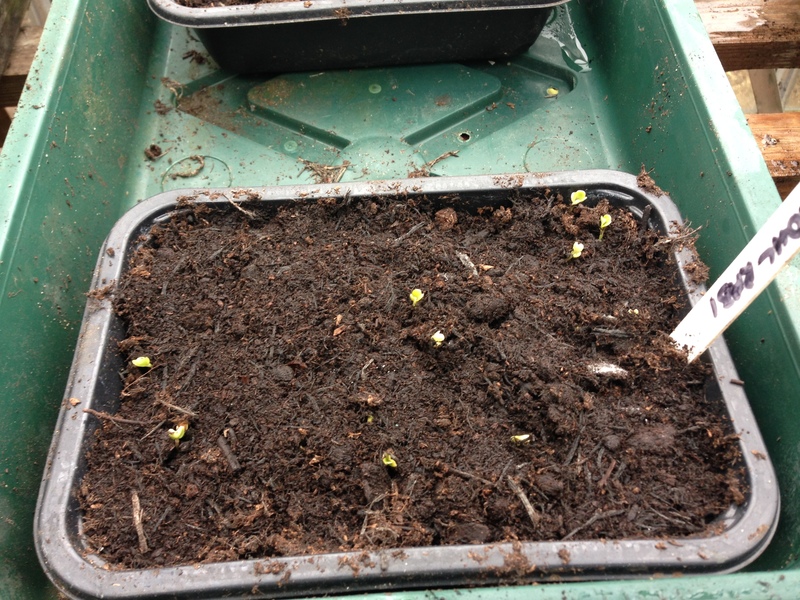 It’s just started to germinate. I’m a very proud mummy. My Kohl Rabi popping though the soil. Grow my beauties. Well that’s it for the day, you can breathe now I’ve finished. Happy Easter to you all. Don’t eat too much chocolate. I won’t be eating any as it gives me a migraine and that’s not fun when it lasts for up to 4 days. I’ll stick with the white wine and I’ll be fine. There are 10 of us tomorrow for Easter Sunday at my house, but we’re all bringing something and helping out, so it’s a joint effort. I have a little Easter quiz planned for after dinner which should be fun. I’ll put the questions to you next week. No prizes for winning though, sorry. This entry was posted in Uncategorized and tagged all year round blend, brassicas, brussels sprouts, cabbage, Calypso, camelot f1, cauliflower, chives, claire's allotment, coriander, Cress, Electric Daisies, garlic, Graffiti F1, homebase, homegrown revolution, http://www.victoriananursery.co.uk/, James Wong, Johnsons seeds, kale, Kelvedon Wonder, Kohl Rabi, Mango, melons, mini veg, Moss Curled 2, Mr Fothergills seeds, Olivia F1, onions, Parsley, Pea, Peppers, Primo (II), Red Veined, Romano Mixed, Sorbet, sorrel, Starbor F1, sutton seeds, sweet peppers, tomatoes. Bookmark the permalink.